An experience quite unlike any other in Africa is a 120 kilometre journey by quad bike across the Makagadikadi Pans. Throw caution to the wind, wrap your head Lawrence of Arabia style in a capacious scarf, ease the throttle forward and cruise across the vast lunar-like salt pans towards a horizon of infinite space. There is no traffic to crash into here – just the opportunity to lose yourself in a shimmering parched landscape, listen to stories of animal migration, visit meerkat hides, and seek the elusive brown hyena. 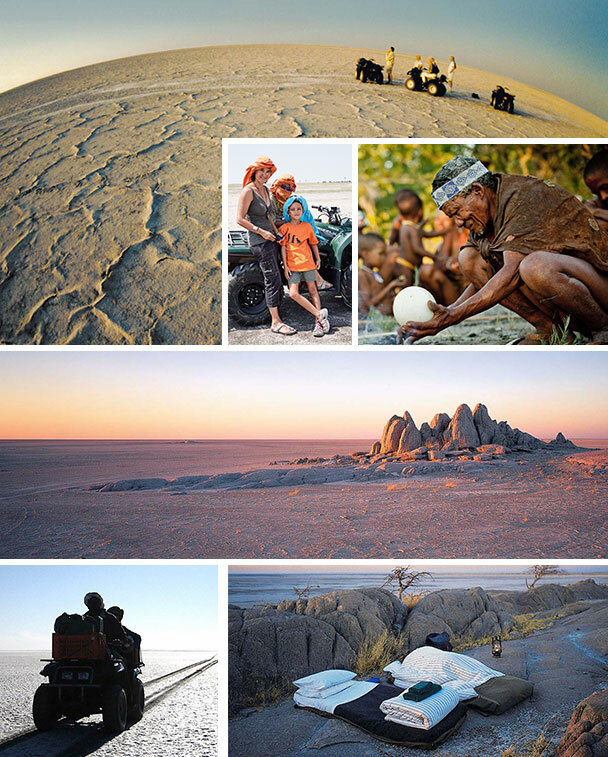 As dusk approaches a smudge on the horizon grows larger and Kubu Island beckons you on to one of the most whacky sleep-outs in this constantly evolving ecosystem – a granite extrusion filigreed with baobab trees which has been the mythical hideaway of the Kalahari bushmen for longer than anyone knows. Back at base camp, more fascinating excursions unfold with expert guiding and the privilege of spending time with the Zu/ ’hoasi, one of the last hunter-gatherer peoples on earth. A five-night package costs from £2,770 per person. For many Africans the elephant has been a scourge: in the 19th century the horrors of slavery were exacerbated by the ivory trade which involved slavers forcing their captives to carry tusks across swathes of the hinterland to the ports on the coast; and an elephant can trash the entire, hard-won crop of the villages of sub-Saharan Africa in a few hours. Fortunately, nowadays many people benefit from tourists coming to see the rapidly diminishing numbers of these extraordinary pachyderms. Sometimes moving large numbers of elephants in wildlife areas is the key to balancing conservation with the needs of local communities. An historic translocation of some five hundred elephants to Nkhotakota Reserve in the centre of Malawi by African Parks, a not-for-profit organisation, has taken two years to accomplish – a remarkable feat and an expensive operation. I first visited this particular reserve in 2014 when the game was thin. 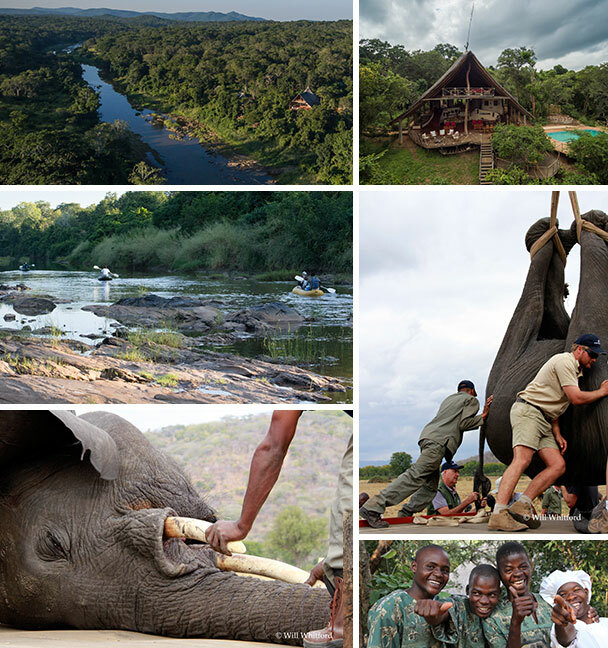 This has changed and there is now an ecologically responsible lodge within the reserve where activities are focused on a “slow safari” experience: walking, canoeing and community visits. Malawi is the oft-unsung hero of the safari scene and whilst the sheer number of game is not in the same league as other areas it has at least four top safari destinations which, coupled with the magical “lake of stars” providing a totally different sort of beach flop, make it a stand-alone destination in 2018. Sossusvlei on your own: Namibia. Climbing one of the highest sand dunes in the world is a must-do activity in Namibia. The dawn light creates beautiful moving shadows and whilst the silky sand makes the climb a little arduous the view at the crest is exhilarating, and running down the slip face at full speed is just the best kiddie fun imaginable. At the bottom our guide will be ready to cook you a slap-up bush brunch. The Sossuvlei area can be a little busy in the peak season, so we have a new, exclusive but not over luxurious tented camp on the vast private Neuhof Nature Reserve nearby. Twenty per cent of the revenue generated goes back into conservation on this desert-animal rich area. 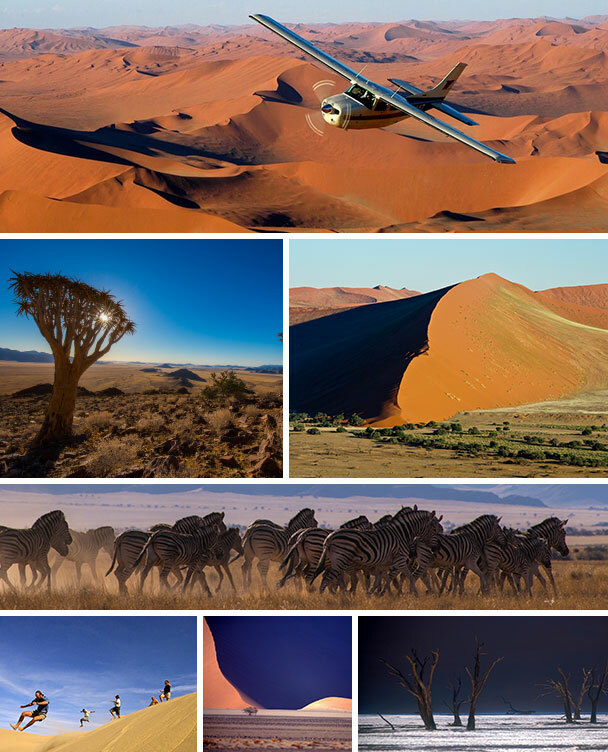 The reserve is perfect for families and small groups; you can roam on special guided excursions which include magic moments in desert pools, star gazing, nocturnal photography sessions, stellar escapes and epic drives up to the plateau for incredible vistas over the Namib desert. Hot air balloons and scenic flights are also available. Privately guided safaris across the vast landscapes of Namibia in specially modified land cruisers are one of my specialities. If you are considering a safari next July/August now is the time to book. Please don’t wait until 2018. Availability in places like Namibia is already difficult! For further information on African holidays please contact Miles on 020 7723 5858.